Definition at line 821 of file iotypes.h. Definition at line 869 of file iotypes.h. Definition at line 871 of file iotypes.h. Definition at line 847 of file iotypes.h. Definition at line 873 of file iotypes.h. Definition at line 824 of file iotypes.h. Referenced by IopCancelRemoveChildDevices(), IopCreateDeviceNode(), IopQueryRemoveChildDevices(), IopSendRemoveChildDevices(), and IopTraverseDeviceTreeNode(). Definition at line 849 of file iotypes.h. Definition at line 850 of file iotypes.h. Definition at line 848 of file iotypes.h. Definition at line 834 of file iotypes.h. Definition at line 885 of file iotypes.h. Definition at line 854 of file iotypes.h. Definition at line 855 of file iotypes.h. Definition at line 880 of file iotypes.h. Definition at line 876 of file iotypes.h. Definition at line 883 of file iotypes.h. Definition at line 844 of file iotypes.h. Definition at line 836 of file iotypes.h. Referenced by IopEnumerateDevice(), and IopInitializePlugPlayServices(). Definition at line 852 of file iotypes.h. Definition at line 842 of file iotypes.h. Referenced by IopGetDeviceRelations(), IopGetRelatedDevice(), and IopInitializePlugPlayServices(). Definition at line 846 of file iotypes.h. Definition at line 826 of file iotypes.h. Definition at line 882 of file iotypes.h. Definition at line 862 of file iotypes.h. Definition at line 827 of file iotypes.h. Definition at line 877 of file iotypes.h. Definition at line 867 of file iotypes.h. Definition at line 858 of file iotypes.h. Definition at line 828 of file iotypes.h. Definition at line 856 of file iotypes.h. Definition at line 887 of file iotypes.h. Definition at line 825 of file iotypes.h. Definition at line 881 of file iotypes.h. Definition at line 863 of file iotypes.h. Definition at line 835 of file iotypes.h. Definition at line 839 of file iotypes.h. Referenced by IoInitSystem(), IopCancelRemoveChildDevices(), IopGetDeviceObjectFromDeviceInstance(), IopGetSystemPowerDeviceObject(), IopInitializeDevice(), IopInitializePlugPlayServices(), IopQueryRemoveChildDevices(), and IopSendRemoveChildDevices(). Definition at line 829 of file iotypes.h. Definition at line 884 of file iotypes.h. Definition at line 831 of file iotypes.h. Definition at line 838 of file iotypes.h. Definition at line 859 of file iotypes.h. Definition at line 857 of file iotypes.h. Definition at line 851 of file iotypes.h. Definition at line 840 of file iotypes.h. Definition at line 841 of file iotypes.h. Definition at line 845 of file iotypes.h. Definition at line 878 of file iotypes.h. Definition at line 843 of file iotypes.h. Definition at line 823 of file iotypes.h. 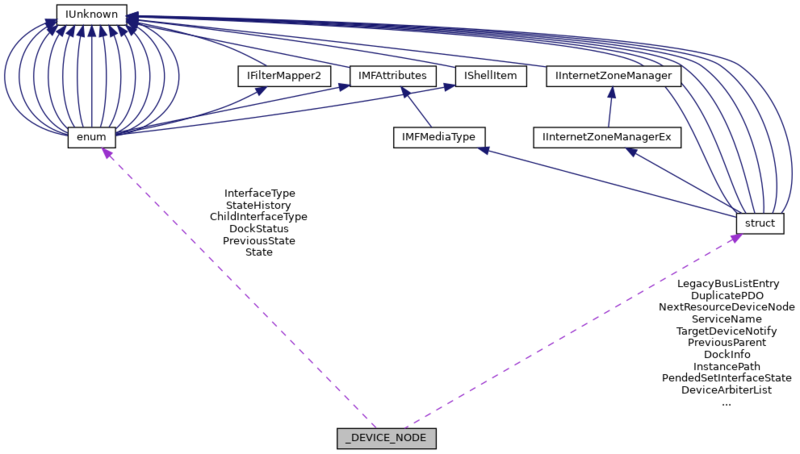 Referenced by IopCancelRemoveChildDevices(), IopFreeDeviceNode(), IopQueryRemoveChildDevices(), IopSendRemoveChildDevices(), IopTraverseDeviceNode(), and IopTraverseDeviceTreeNode(). Definition at line 830 of file iotypes.h. Definition at line 832 of file iotypes.h. Definition at line 833 of file iotypes.h. Definition at line 853 of file iotypes.h. Definition at line 837 of file iotypes.h.